Throughout this week in our Catch Share Conversations series, we have explored the importance of monitoring, and discussed best practices of monitoring systems. Today, we present two case studies—British Columbia Groundfish and Gulf of Mexico Reef Fish– that highlight the diversity of fisheries and accompanying monitoring systems. These distinctly different examples show how monitoring systems reflect the unique goals and characteristics of a fishery and how two different fisheries design monitoring programs to meet their needs. The British Columbia Groundfish fishery is a multispecies fishery with a fleet that employs a wide range of gear types. It employs one of the most sophisticated monitoring systems in the world, including hail in/hail out, 100 percent dockside coverage, 100 percent at-sea monitoring, including observers for trawl vessels, and electronic video monitoring for hook & line and trap vessels. 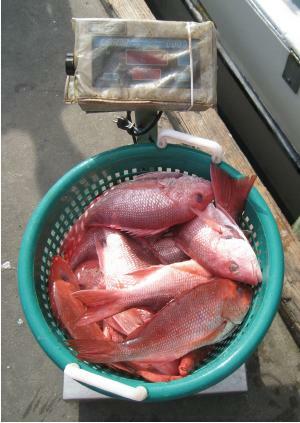 The Gulf of Mexico Reef fish fishery is a multispecies fishery. The fishery uses logbooks, partial at-sea monitoring, dockside coverage, electronic reporting, VMS and hail in/hail out monitoring techniques to reach program goals. Read the complete fact sheets for more details on the British Columbia Groundfish and Gulf of Mexico Reef Fish monitoring systems. This entry was posted in Gulf of Mexico and tagged Catch Shares, Fisheries, Groundfish, Gulf, Management, Monitoring, Oceans, reef fish. Bookmark the permalink. Both comments and trackbacks are currently closed.